This article is about President Koopa, the leader of Dinohattan. For King Bowser Koopa, the character this character was based upon, see Bowser. King Koopa, often Koopa and also referred once as President Koopa, is the primary antagonist of the Super Mario Bros. film, portrayed by Dennis Hopper. He represents Bowser, the main villain of the video game franchise on which the film was based. The character is portrayed as the corrupt, unopposed ruler and self-proclaimed "president" of Dinohattan. Unlike his in-game counterpart who is the leader of a race of turtles, President Koopa, like the other inhabitants of Dinohattan, is a humanoid of reptilian origin, descending from the Tyrannosaurus rex. He is portrayed as a former subject of Dinohattan's rightful king, who revolted and took control of the realm from him. He later plotted a full-scale assault and takeover of the human dimension, which he would achieve by reuniting and merging the two dimensions into one by inserting Princess Daisy's meteorite shard back into its proper place. Sixty-five million years ago, a meteorite crashed onto Earth, somehow isolating a population of dinosaurs in a Earth that is in a dimension parallel to our Earth. It is in this dimension that the dinosaurs continued to live, and, like the apes on Earth, evolved into a human form. Koopa is one such humanoid dinosaur, having descended from a Tyrannosaurus rex. General Koopa pursues Daisy's mother on Earth. Originally serving as a top military leader, Koopa eventually seized control of Dinohatten from Daisy's father, whom he turned into fungus, with plans to use a shard of the meteorite to reunite the dimensions and allow him to take over Earth as well. However, Daisy's mother manages to take the princess and the shard through a portal to Earth, leaving them at the entrance to a cathedral before trying to return to Dinohatten, only to be captured by Koopa. Earlier, he killed the portal's keeper as part of his coup d'état, and now demands the meteorite shard from her. In the ensuing struggle, however, Koopa accidentally knocks over a support beam and the tunnel collapses, crushing Daisy's mother and blocking off the portal. Several years later, when the portal is finally reopened, Koopa assigns his cousins Iggy and Spike, who are also his minions, to retrieve Princess Daisy so he can use the meteorite shard she carries for his master plan. However, his bumbling cousins continuously deliver him the wrong girls, until finally succeeding in kidnapping Daisy. They barge into his office after he had done a routine de-germification of his palms. However it turns out that they lost the shard to Mario and Luigi in the process of capturing Daisy. Later, after Mario and Luigi are arrested, they are taken to see their lawyer, who is actually Koopa under an alias. He tries to trick the brothers into handing over the necklace, which has the shard on it and which they don't have anymore, eventually reaching the point where he physically assaults the brothers and orders them and Toad to be de-evolved. In the de-evolution chamber, Koopa witnesses as Toad is turned from a human like state to a Goomba, a strong, large, and stupid being loyal to Koopa. He then orders the brothers to tell him where the necklace is, or face de-evolution. After a technician ended up sneezing, Koopa, because of his germophobic nature, as well as to do a further demonstration to the Mario Bros. regarding the properties of the de-evolution chamber, has the technician executed by turning him into primordial slime. However, the brothers escape, pushing Koopa into the de-evolution device, defeating all of his minions, and setting the machine for the Jurassic period. While the de-evolution ends prematurely and Koopa remains in his human-like form, his eye briefly becoming more reptilian hints that he had in fact been affected by the machine. He then angrily demands that they recapture the Mario Bros.
Iggy and Spike later break in on Koopa and Lena's mud bath, reporting that Mario and Luigi are in the Koopahari Desert. Koopa orders Lena to bring him Daisy, and has Iggy and Spike taken to the de-evolution chamber. However, instead of de-evolving them, Koopa has his cousins evolved, which results in the pair becoming smarter. He then orders the pair to capture Mario and Luigi and retrieve the shard or be killed, also specifying that he himself will execute his cousins in person. Koopa is discussing training his Goombas with the de-evolution gun when Lena arrives, telling him that Daisy is ready. He is then finally introduced to Daisy, who is in another room with Yoshi, a baby tyrannosaurus rex. He surprises Daisy by entering the room and telling her Yoshi is a dinosaur. Ignoring her pleas for the whereabouts of her father, Koopa tells her that she also descended from dinosaurs, and, afterward, his head begins to show dinosaur-like traits and he nearly seduces her. A frightened Daisy then runs away, but is caught by a Goomba, whom Koopa demands to take Daisy away. President Koopa conversing with King Bowser. At another point, he enters Devo 4, the holding chamber for Daisy's father, where he engages in small-talk with the fungus. He eventually states that his rebellion will have been in vain after the dimensions have been united. Lena later enters Koopa's quarters, secretly possessing the meteorite shard, with Iggy and Spike as her prisoners. She convinces Koopa that they were now against him, and he orders them to be killed. He then walks off with Lena, who tries to reveal that she has the shard, only to be ignored. She bemoans the fact that Koopa only cares about Daisy now, while he states that he only cares for the future of their species and leaves, whereupon Lena decides to take action on her own. Koopa is later told by the police chief that the army is ready for the invasion of earth. Alarmed by this, Koopa demands to know who gave the order, to which the chief states that he did, according to Lena. Koopa then figures out that she has the shard, and demands her arrest. He, along with a Goomba entourage, later run into Luigi and Daisy and capture the duo. Afterward, he orders the preparation for the invasion of earth. 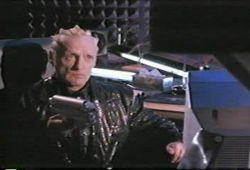 Eventually, the police chief captures Lena and delivers the shard to Koopa, and he then orders to prepare for the invasion. Koopa having devolved into a Tyrannosaurus rex, then into primordial ooze. Outside, Koopa and a small group of Goombas are distracted as Mario, as well as the missing girls from Brooklyn, fly out of a ventilation shaft on a mattress, allowing Luigi and Daisy to rejoin Mario. However, Koopa then approaches the brothers with a flamethrower, declaring he had won, and gives several commands through a communicator. The distracted Koopa does not notice Luigi grab a Banzai Bill from a local shop, which Mario loads into a Thwomp Stomper and activates it. The stomper knocks Koopa into an empty vat above streets. Mario, using some fungus as a vine, leaps onto the bottom of the vat, climbs on top of it, and hits Koopa, knocking the shard out of his hand. Not being able to locate the shard, Mario is able to trick Koopa into thinking he has it. They continue the fight on a catwalk, Mario pulling out the Bob-omb the brothers retrieved earlier and winds it, though the bomb falls through a hole. Unaware that the Bob-omb is still on its trek, the two dimensions begin merging before their eyes. Mario, Koopa, and his legion of Goombas appear at the excavation site after Koopa's tower merges with the World Trade Center. Casting aside the flamethrower, which no longer functions, Koopa takes a de-evolution gun from a Goomba and fires at Mario, though he dodges the blast, which accidentally hits Anthony Scapelli, a business owner, and turns him into a monkey. He tries firing at him again, but Mario pulls out a mushroom the brothers found earlier to absorb the blast. The mushroom starts to grow, eventually becoming really large, and Mario uses it to attack Koopa, knocking the gun out of his hand. Thanks to the efforts of Luigi and Daisy, the dimensions are split again, and Mario is joined by Luigi, who hands him a de-evolution gun. He attempts to have his accompanying troops shoot him, but the Goombas end up failing to obey the order by dancing thanks to Toad playing the harmonica, exploiting an earlier weakness of the Goombas, causing Koopa to angrily punch them down dominoes-style. The brothers then fire the guns at him after he attempts to strike them with his now functioning flame gun (the latter missing them and instead hitting a Koopa propaganda poster depicting him kissing a baby), which began devolving him, granting him definite saurian features just as the Bob-omb arrives right beneath Koopa and explodes, sending him flying into the empty vat. After a moment of silence, he emerges from the vat, having de-evolved into a Tyrannosaurus. The brothers then continuously blast Koopa again until he finally devolves into primordial ooze, which defeats him. Koopa has a similar personality to that of Bowser in the games at the time. However, he also is shown to have an understandable motive in regards to remerging both dimensions, citing that he intends to use Daisy to merge them for the future of his species, especially since his species has to go through several hardships that stem from the parallel world being a near-complete wasteland. Despite this, Koopa still sees himself as an evil person; while pretending to be a lawyer for Mario and Luigi, he tells them that he "is one evil, egg-sucking son of a snake," and does not deny this after his true identity is revealed. Koopa is also shown to be very ruthless in his pursuit of his goals, as after "evolving" his cousins Iggy and Spike, he threatened to personally execute them if they fail to retrieve both the Mario Bros. and the meteorite, with Iggy and Spike earlier implying when trying to locate Daisy that, should they abduct the wrong girl yet again, Koopa may end up doing far worse to them than simply have them executed. Likewise, he also immediately ordered for Lena arrested after deducing from her giving an order in his name to start the invasion without his knowledge that she had retrieved the meteorite and kept it for herself. Koopa has also been shown to be a germophobe. In his first appearance when he is ranting about how he is ruling a world overwhelmed with fungus and slime, he is seen dunking his hands in boiling mud in an attempt to sterilize them. When he first meets the Mario brothers, he shakes their hands, but wipes his hand off with tissues afterward; after assaulting Luigi soon afterward, a police officer spray his hands with disinfectant, and even later he has a lab technician devolved into primordial ooze simply for sneezing in his presence. He also is seen relaxing in a mud Jacuzzi right before ordering Lena to bring Princess Daisy before him. President Koopa is almost entirely human in appearance, with blonde hair he gels in the shape of a crown, and he frequently wears a black business suit and tie. However, after being briefly exposed to his own Devo machine by the Mario Bros., he started occasionally possessing some reptilian traits, such as a long, pointed tongue, slitted pupils, and in a few instances his entire face briefly morphing to become more reptilian. Near the end of the film, when Koopa is forcibly de-evolved, he becomes a grayish-green Tyrannosaurus rex, though he has a few differences when de-evolved such as having big arms instead of the small arms from the actual T-rex, though they become small before he turns into a large glob of primordial ooze. In one of the deleted scenes for the film, then-General Koopa briefly explored the upper levels of New York City while attempting to hunt down Daisy's mother and the meteorite, and briefly saw the skyscrapers of New York City, which would have explained why he had the capital of his dimension renovated to resemble Manhattan. ↑ 1.0 1.1 This was shown in a deleted scene, which was also kept in the junior novelization. Although the scene was deleted, the event was nonetheless implied in the final version due to the slime being present during the Mario Bros' revolt, where one of Koopa's henchmen slipped on it.